It's been said before that funny doesn't equal money in wrestling. It's a slam against so called comedic wrestlers. Santino Marella and Zack Ryder come to mind immediately. While they're likely never going to be world heavyweight champions in their current gimmicks, I do find both men to be entertaining for the most part. I'll go ahead and throw Brodus Clay into that pot too. 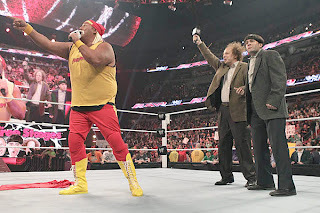 However, the WWE's integration of the Three Stooges on the April 9 episode of Raw was lame. Sometimes the guest hosts work, the Muppets and Bob Barker were enjoyable in my opinion. But the Three Stooges may go down as one of the lamest in the history of the show. The first segment with Santino made me wish I wasn't watching the show live. I will admit though that the Kane segment brought a smile to my face. I know Kane is the heel and the Stooges (specially Curly or Will Sasso) are the faces and there to entertain. Sasso's mannerisms as Hulk Hogan were down to a tee, but it was enjoyable for me to see him get chokeslammed. I think the fans in attendance agreed. I only hope this doesn't lead to Sasso's induction into the WWE Hall of Fame Celebrity wing (after all he did wrestle Bret Hart on Nitro back in 1999) Luckily this segment lasted only a few minutes. I'm not going to rant too much on this, as it appears it was just a one night only situation. Sure it took time away from more important wrestlers. It would have been nice to see the tag team titles defended. Remember those guys? I wonder if the creative team does.